Defying the rest of the field! 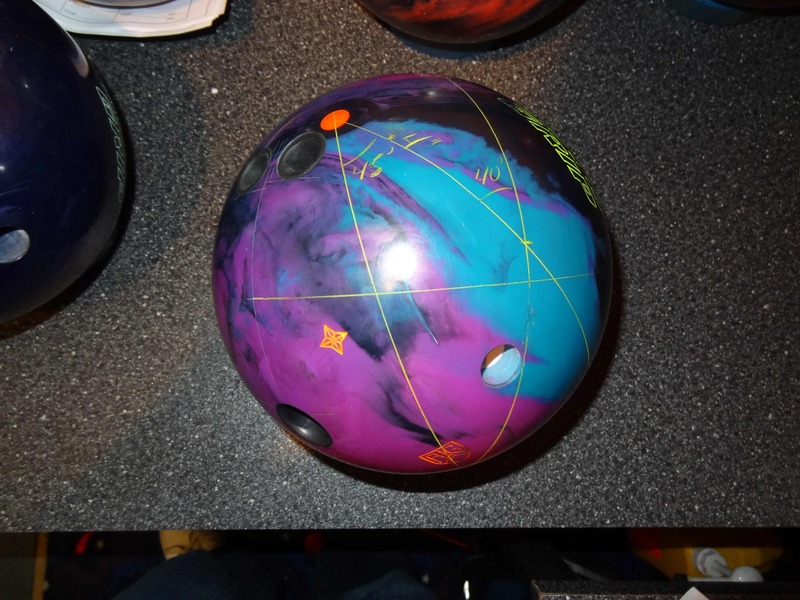 Our latest tester, Eric Deaton, is testing the Roto Grip Defiant bowling ball. Eric manages the Strike Mor Pro Shop in Toronto, Ontario, Canada. He is a righty rev-speed matched, medium speed stroker. The ball was drilled by Eric as well. I also tested the Defiant. I am a lefty rev-speed matched, power stroker. The ball was tested on Kegel Easy Street used as the house shot as well as the Viper pattern. Eric’s PAP is 4 3/4 and 5/8″ up. The ball is drilled 45 x 4 x 40. The ball will not get into a roll too late or too soon. It will also transition medium speed at the breakpoint. The 4 inch Pin to PAP on this asymmetrical ball will allow a lot of flare. My PAP is 5 3/8 and 3/8″ up. The ball I tested was 75 x 5.5 by 35. This drilling will allow the ball to roll relatively later roll, with a medium to quick transition at the breakpoint. The pin distance will allow max flare and promote more forward roll. This is a type of “long and strong” drill. Honestly, I don’t say this too often. However, the first impression of this ball is the Defiant is a beast! I was a bit jaded after my impressions of the Critical Theory. While most “strong” balls can’t make the big turn, I thought that was one of the strongest bowling balls I have thrown that could actually make that massive turn. I thought any stronger than the Critical Theory and how can it possibly make the turn. Anyway, throwing this ball made me realize there is a step up for sure. Roto Grip’s Crown line is pushing the pricing up a bit so it’s pretty comparable to the cost of most high end balls right now. The Paragon core is an asymmetric core with a low RG of 2.49, differential of .054, and a mass bias of .17. Roto Grip is hyping up this design. I’m always skeptical, but watching the ball reaction gives good reason to be excited about it. I’ll talk more about it in the ball reaction section below. The MicroBite Solid Reactive cover is new for Roto Grip. The factory finish is 3000 abralon, which is becoming more popular these days. Not quite as aggressive as 2000, but offers a bit more grip and backend of the 4000. Roto Grip basically describe this technology as different from “nano”-particles and macro-particles. So it’s not quite your old school particle reactive resin, but conceptually gets at the same purpose, to allow for more surface area allowing for more oil absorption and creating more friction for more hook. While I am a scientist, I am not privy to the technological specifications so I can’t really tell you if this has offered something truly unique in terms of technology. Nevertheless, this cover seems a very good match to the core to generate a strong ball that still stores enough energy for the big backend move. It rolls heavy into the pocket. Many people I know seem to like to leave the OOB finish as it seems to work just right so we didn’t play with surface adjustments. We will likely experiment further and add to the review. I immediately have to compare the ball reaction to the next strongest ball in their lineup, the Critical Theory. The ball has reasonable length, a strong midlane read, and a strong backend move. For me, it covered several more boards than the Critical Theory. However, it is stronger up front and in the midlane. I would say it’s transition on the backends is not quite as defined as the Critical Theory. In other words, it’s a bit smoother. The Critical Theory combining a pearl cover @ 4000 abralon and the Triliptic core created a more defined move at the breakpoint. It wasn’t jerky, but very obvious, consistent, and had a heavy roll. The more squarish style core helped define the reaction. By contrast, the stronger MicroBite cover combined with a “rounder”-style Paragon core allows for smoother transitions. What you get is decent length, a bit stronger midlane and a smoother transition from the hook to roll phase. It still has that heavy punch on the backend. Both balls roll heavy into the pocket. The other thing that I noticed is something I don’t recall seeing before. It seems that through the transition from skid to hook, if you look closely, you can almost “feel” the ball transition through planes of the core. I’ve noticed balls lope before, but this ball lopes just a bit differently. It’s almost like it’s seeking the best plane to hook from. I think this has to do with contours in the core design. We’ve seen this ball on 42 ft THS, 38 ft THS, and Viper. On the longer pattern, the ball is in its element. I am not a cranker, but I felt like I can just keep moving in and still get this ball to make the big move and carry. I tried a bit straighter trajectory from 15 to 7 and the ball really drove heavy into the pocket. I kept moving in and not until I got to 24 to 9 did I finally leave a flat 7 pin. Mind you, I’m a lefty and we usually don’t have to play anywhere near that deep. Eric tested the ball on 38ft THS and Viper. Even for Eric’s game, he would not go to the Defiant first on the 38 ft pattern. It just seems a waste on such a good strong ball. You may be fighting it a bit. If you have less revs or higher speed, it may work fine. The Viper pattern, although only 37 ft, is actually quite heavy. Eric has it drilled for longer patterns so that it transition properly from hook to roll. However, the ball was versatile enough for him to find a line to play. It was clean up front, but does labor slightly due to the pattern length. Below, you can see the Digitrax analysis for Eric’s test on the two patterns. 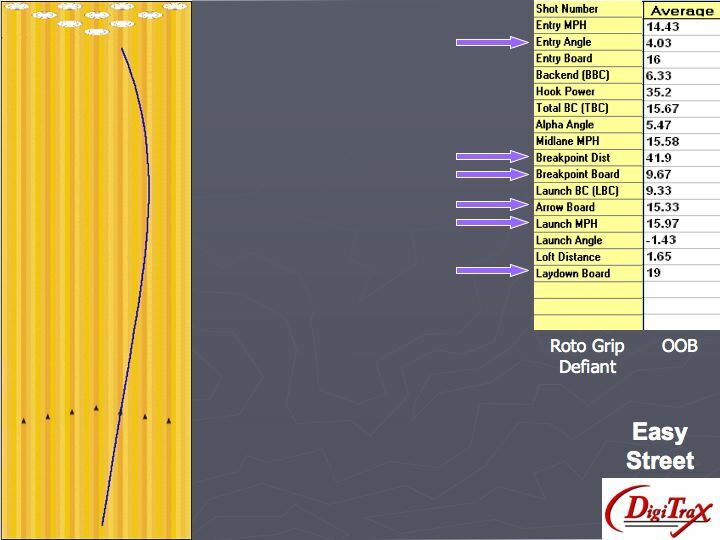 The Roto Grip Defiant is a quite impressive piece. I tend to wonder about balls that have too much overall strength, how playable they will be for the average bowler, and the coverstock longevity. I think it’s fair to say you have been forewarned. This is most definitely a strong piece. I hate saying “it’s the strongest ball ever” jargon, but suffice it to say you will be hard-pressed to find a stronger ball. I’m sure there are others that are quite strong so I don’t want to belabor the point. The key for me is that the Defiant retains the punchier backends of typically medium-end balls, but rolls heavy into the pocket like a high end ball should. This produces lots of continuation through the pins. 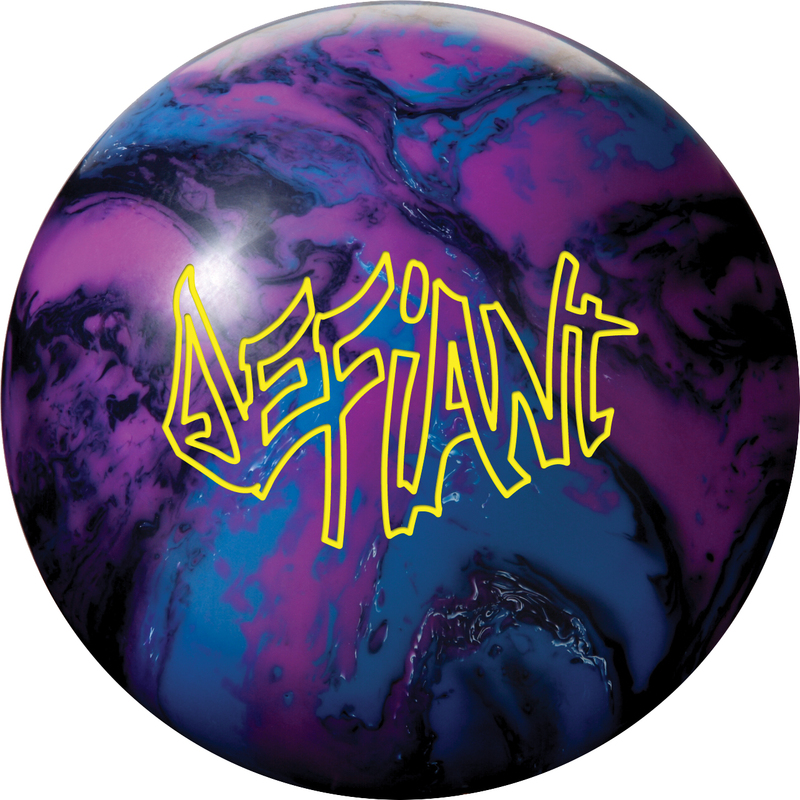 If you are looking for your new monster ball, the Defiant should certainly be a contender. Love your ball reviews being that I’m a lefty, your one of the few sites that has a left-hander for testing. But one thing puzzles me! When the lefty throws you show the right hand view, but when a right-hander throws you don’t show the left-hand view. Hi Arthur. Thanks for your support. It’s a good point! In all future videos, I will show both views. Us lefties have gotten used to watching a righty video because of the lack of availability and then have to extrapolate. We don’t have to do that anymore! Love your ball reviews being that I\’m a lefty, your one of the few sites that has a left-hander for testing. But one thing puzzles me! When the lefty throws you show the right hand view, but when a right-hander throws you don\’t show the left-hand view. Hello, i play bowling with two handed style that need more ball speed(more than 31 km/h) and I really need more back end reaction of the ball..curently I’m using storm marvel ball and I find that ball doesn’t have enough back end reaction to hit the pocket..my question is,is it a Rotogrip Defiant ball is suit me as two handed thrower that require more speed and backend reaction ? Sometime i saw jason belmonte using this ball on heavier oil condition. Hello Fahmi. It will depend on which conditions you bowl on. If you bowl on heavier conditions, some aggressive equipment like the Storm Virtual Gravity Nano or Roto Grip Defiant may be appropriate. The Marvel is a smooth hooking ball which may not appear to have a lot of backend. However, if you try to use these very aggressive balls on lighter equipment, they may also seem to have little backend because they burn up, meaning they use up too much energy in the front where there is friction. If you are on medium to medium heavy conditions, a ball like the Critical Theory has been known to have very strong and continuous backend and may be more appropriate. The Marvel Pearl might also work well. Jason Belmonte used those balls quite a bit this year. If you are on ligher conditions, you will want to look at some lower end equipment as they store good energy for the backends. If you want to share more about the conditions you bowl on, maybe we can help further.